I wrote this letter not long after the Mumbai tragedy. 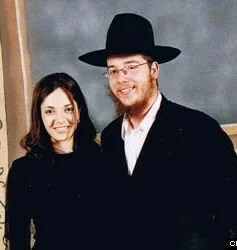 I found it recently going through my files, and I wanted to share it as we remember the events of that awful day, and mourn the martyrs we lost, including Rebbetzin Rivkah Holtzberg and Rabbi Gavriel Noach Holtzberg, OB”M, pictured. As we all try to come to grips with the aftermath off the tragedy in Mumbai, it is only natural that we are afflicted by feelings of anger, or sadness, or hopelessness, or despair. Each of us will feel a different combination of these, and sometimes we will feel them all at the same time. All of these feelings find their sources in the neshama, that spark of G-dliness that on the one hand cries in pain for our loss, and on the other calls for – indeed demands – a healing of the wound that this event has torn into our nation and into the body of mankind. Whether we stand among the wreckage of what days ago was a refuge of Torah in the heart of a bustling city, or whether we sit thousands of miles away, we are gripped by the desire to do something, the desire to respond, and the frustration that comes with not knowing how. Yet as we mourn for those we have lost, as we worry for those left behind, act we must. For there is much to do. Despite having lived through some of the greatest horrors in the history of mankind, Rabbi Menachem Mendel Schneerson (Of Righteous Memory), the Rebbe of Chabad-Lubavitch, understood that not only is it fruitless to respond to darkness, hate, and anger with more of the same, it works against the very nature of the Jewish People to stand as a light among nations, a Kingdom of Priests, a Holy people. Instead, our Rebbe taught that the way to respond to anger and hate is to reply with love, the way to respond to destruction with charity, the way to respond to despair with hope, and the way to battle the darkness is not with more darkness, but with light. With your help, we can spread light even into the darkest corners of the world this Shabbos, and help speed the day when Moshiach comes and brings the Light of the Master of the Universe to us all. This entry was posted in Action/Gemilut Hasadim, Jewish Affairs, Tikkun Olam. Bookmark the permalink.